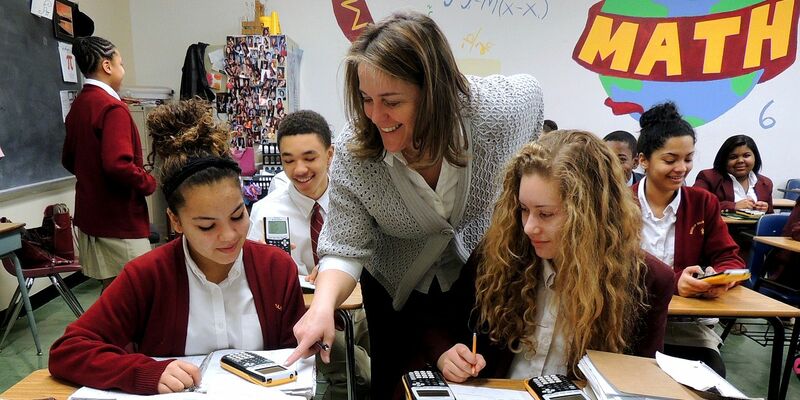 Bishop McNamara Advanced Placement Program offers rigorous college-level curricula and assessments to students in our high school, bringing a rich college experience to Bishop McNamara with the opportunity to earn college credit at thousands of universities across the nation. AP Courses are offered in English language, English literature, digital art, calculus, statistics, computer programming, psychology, chemistry, biology, physics, French, Spanish, U.S. history and European history. Advanced Placement courses may also be offered in music theory, Latin Vergil, Latin Poetry, and modern & classical language literature, as well as others determined by student interest. AP courses are taught by highly qualified Bishop McNamara teachers who use the AP Course Descriptions to guide them. The course descriptions outline the course content, describe the curricular goals of the subject, and provide sample exam questions. While the course descriptions are a significant source of information about the course content on which the AP Exams will be based, AP teachers have the flexibility to determine how this content is presented. Feel free to go to AP Central at CollegeBoard for more information. AP® is a designation for a course that involves preparation for an AP® exam. AP® exams are administered in the second week of May each year, by CollegeBoard®, the makers of the SAT®. Who should take an AP® course? Students identified by their instructors as possessing the skills, background knowledge and demonstrated success in pre-AP® work. Students willing to commit extra time and take more control of their own learning process. AP® courses allow students to pursue subjects that interest them with particular thoroughness, intensity and rigor, similar to college level classes. AP® courses often move at an accelerated pace. Colleges often ask if a student took the most challenging level of a course possible. In multiple subjects, AP® courses are the most challenging courses we offer. Students earn 1.0 weight towards their grade point average for every AP® course. Note: Each year all courses are reviewed, including AP® courses. These listed courses may or may not represent all the choices available in the years to come. Why take an AP® exam? AP® exams give students a chance to compete with other bright, motivated students throughout the country. AP® exams give students an introduction to the kind of thorough, challenging exams that are often the main components of their college grades. Students can receive college credit for high AP® test scores, fulfill requirements, or take more interesting intermediate level courses sooner, depending on the colleges they attend. The fee for an AP® Exam is set by the CollegeBoard®. Parents will submit an online registration form and the fee for each AP course their student is taking. Information regarding exam registration, fees and dates are sent to parents and students via email. Fee reductions are made available to students who qualify according the guidelines provided by the CollegeBoard®. This process must be initiated early through the Counseling Office. From the moment you enter an AP classroom, you'll notice the difference in the teacher's approach to the subject, in the attitude of your classmates, in the way you start to think. In AP classrooms, the focus is not on memorizing facts and figures. Instead you'll engage in intense discussions, solve problems collaboratively, and learn to write clearly and persuasively. More than 90 percent of four-year colleges in the United States and colleges in more than 60 other countries give students credit, advanced placement or both on the basis of AP Exam scores. By entering college with AP credits, you'll have the time to move into upper level courses, pursue a double-major or study abroad. Registration is completely online in Parents' MACCESS under "My Forms"
Registration ends early in April each year with a late fee assessed after that date. Students approved for accommodation with the College Board should contact the Counseling Office as soon as possible prior to testing dates for information regarding AP Exam accommodations. CollegeBoard® assesses a fee for those students who have not taken their AP exam. If a student has an emergency illness on the day of an AP exam, the student MUST contact the Academic Dean as soon as possible.